Career? I retired from IBM in 1993 after 25 years of sales and sales management. Then I worked for eight years as an Account Executive with Agilysys, a Premier IBM business partner. My last corporate employment was with ADT as a sales Account Manager. I left ADT in 2012. Lifetime miles? Maybe 100,000? Who knows. I’m just glad to still be here. Berkeley High School. I loved competing whether it was high jumping in my back yard or playing basketball at the park or riding my bike long distances. I started running a measured 50-yard dash on the sidewalk in front of my house. My buddies and I would line up with a stopwatch to see who was the fastest. I would always lose the sprints so I decided we needed a longer race. We set up a course around the block and I found I could win those “distance” runs of 440 to 660 yards. So I ran to improve my youthful self-esteem. Berkeley High School had a magnificent huge record board that stood 8 feet high and listed all of the names of the track and field record holders in big letters and numbers. It was stationed at the start of the 100-yard dash on the track for everyone to see. I dreamed of having my name on that board one day. When I graduated in 1960, I owned the 880, mile and 2-mile records. How much did you run during your peak years? Now? 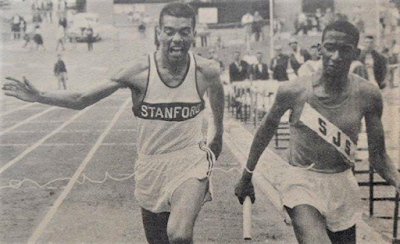 I ran 30-45 miles per week at Stanford during 1961-65 and I ran 45-60 miles per week while I was training in the United States Air Force, where I represented the joint military T&F team and tried out for the 1968 Olympics (didn’t make the team). Now, at age 76, I walk 4.2 miles three times a week, and I hit the gym twice a week. How did you train when your were young? Now? At Stanford, I did lots of interval training on the track. Repeat 220s, 440s with a short walk or jog in between. I ran a lot of cross country runs in the Berkeley Hills, some of which could bring you to your knees because of the steep grades. When I was tired I would do slow runs around Berkeley’s aquatic park or jog at the Berkeley Marina or hit a slow jog around San Pablo Park, my neighborhood hang out. Medley. Tucker clocked a 4:03.9 and McCalla a 4:06.5. Learn more about Tucker here. I don't run now, but I have a walking partner who pushes me, and I push him, on our 4.2-mile course three times a week. My gym workouts consist of 50-100 pound weights where I spend about 1 hour pressing the iron twice a week. I do my own yard work, which can be pretty taxing as well. 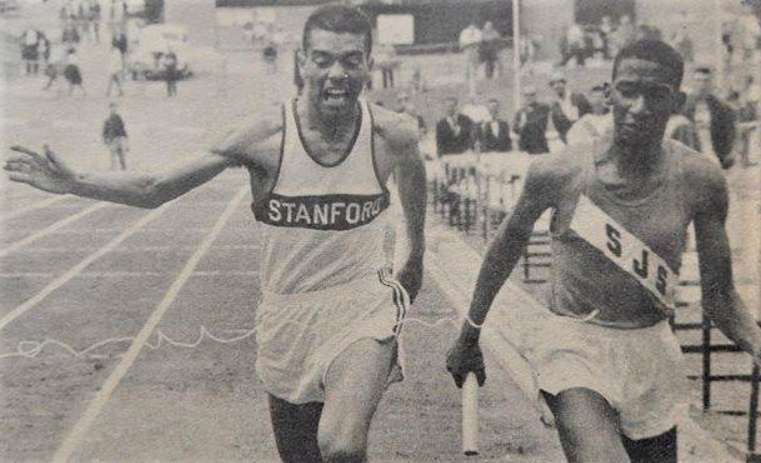 Memorable races: In 1963 while at Stanford I ran a 4:01.5 mile (top time for a black collegian for eight years) against tough U. of Oregon opponents. In 1962 and 1964 I finished 10th and 11th in the NCAA cross-country championships in East Lansing, Michigan, obtaining All American Status. In 1967 I ran against Jim Ryun in his world record mile (3:51.1) in Bakersfield CA. I ran 4:00.6 that day. Diet and weight? At my peak I weighed 150-158 lbs. Now I weigh 168 lbs-173 lbs, so my weight has been amazingly consistent over the years. My diet is nothing to brag about. I probably ate more red meat then than I do now. I’ve never gotten enough good protein but I’m doing better now. I try to get more fish into my diet but it’s a struggle. I try to get more green stuff in my body like fruits and veggies. I’m really in great shape and I could be running now. I choose not to do so. Cross training? I don’t do much cross training now. I used to ride my bike, play tennis, and swim along with the running. I do plan to add biking to my training this year both indoor and outdoor. Social running? I would love to go down to White Rock Lake in Dallas or Bachman Lake and join a team of joggers (in my age range, 60-80 years old). But that would take several months of preparation, and I’m not sure if I want the pains and possible injuries that accompany the joys of social running. I could be talked into it. If Ben Tucker were here in Dallas I would jog with him and try to give him a beat-down for beating me in the 1960 California State high school mile championships! He won in 4:14 and I came in 3rd in 4:15. Obstacles along the way? There are no real physical obstacles to keep me from running now or back in the day.... other than maybe fear of injury, fear of the pain of getting in real running shape again and, finally, fear of losing the race. But once you’re in shape those fears fade away and there is no greater joy than to be in top running shape! Favorite quote: “God is good all the time.” Whether you’re injured or healthy, He’s there looking out for you. Running philosophy: Running brings you good health, respect and lifetime friends. Running also brings you honor and great self-esteem. So run for the joy and good health, run to win the race, but never ever give up. Always finish the race! How has running helped you with the aging process? Running, walking and training in the gym has brought me to age 76 feeling like I’m in my early 50s, looking good (for my age), feeling good and staying very active. I take two prescriptions, a statin to keep my cholesterol in check and a drug to keep my prostate from growing. I think that’s pretty good at my age. Of course a good diet is the real key to staying healthy. I still have work to do that, like cutting back on sugar and bad fats, getting more organic fruits and veggies, drinking more water etc. What life lessons have you learned through running? Stay in your lane. Don’t bite off more than you can chew. You can start off slow and still win the race. Never give up on your goal. When things get tough, dig down and remember those tough workouts that brought you the victory. You can’t tell a winner by his/her size, color or shape. Winners come in surprising bodies. Respect your competition! For me, the most important lesson of all is to cherish the fabulous friends I’ve made from the track and field community. What advice would you give a young runner who wants to run for life? Find your race specialty: sprints, hurdles or distances. Then set your goals and put your whole heart, mind, and body into running, and it will bless you beyond your wildest imagination. Even if you change sports, the running foundation will prepare you to be a star!